This week Cara chose 4th of July as our theme. I thought that would be a perfect theme since we had a long weekend full of celebrating. I really wanted to get a shot of some big fireworks. I don't know how many shots I took. I never really got that money shot, but I did like how this one made the sky look red. Don't you just love Cara's bokeh? 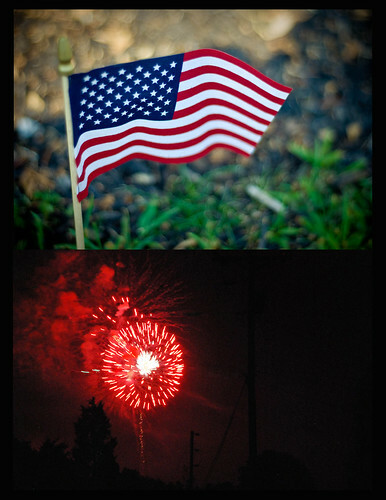 I think it is the perfect 4th of July shot. Visit Mental Inventory for more Team-Up Thursday. That big red burst of beautiful is so pretty. I really like the shadow of the trees as well. The bokeh on the flag is great. Great photos team! The trees illuminated with the red sky is so very cool and your shots look great together, too! Very 4th of July festive! Yes very festive and I love both of them! The red is almost biological! What an amazing color! Fireworks are so hard to catch. You did a great job! Love the flag shot too. Fireworks are so hard to capture. Your's turned out lovely. To be honest I haven't even pulled my attempts off the camera yet. lol Great combo though! i love this holiday dip -- so perfect for the occasion -- and these two just fit hand-in-glove! gorgeous color in that firework! We actually didn't watch fireworks this year, we watched a laser show at a private party my husband D-jayed. I love your fireworks, I want to try to capture some one of these days! what a beautiful diptych! sigh.....I love how fun it is....and....just beautiful. well done.